This post is a response to Doug Belshaw’s post: Learning Taxonomies: Why ‘creating’ is not a cognitive skill. While I do agree that ‘creating’ does not belong above evaluation and that there is room for some revsion of Bloom’s Taxonomy, I do believe that ‘creating’ is a cognitive skill. In fact, I believe that it should be an integral part of all learning taxonomies; that you can’t be fully literate until you have created something. You can’t create something without some prior knowledge. It is from this knowledge that you can make decisions and by it’s very nature ‘decision making’ is a cognitive skill. Moreover, all creation is a result of our experiences. Arguably, there is no originality in creation any way (Strinati, 1997). When we create we make both conscious decisions and unconscious decisions, based on our learned experiences. To take Doug’s son creating his first piece of art as an example: Yes he can paint a picture without having learned to analyse, synthesise (consciously) or evaluate. However, his behaviour is not ‘original’, it is learned and is born out of memory, therefore he is replicating learned behaviour. The way he holds the brush, the choice of colours and so on, all represent decisions, some more conscious than others, but decisions none the less and therefore show a cognitive process in action. I think that the SOLO Taxonomy that Doug referenced actually comes close to acknowledging ‘creating’ in its more rightful place. In this taxonomy the phrase ‘Do simple procedures’ is used right near the beginning and I would argue that ‘simple procedures’ can be interpreted as ‘creating’. 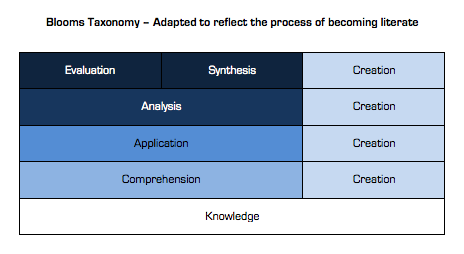 If I were to adapt Bloom’s Taxonomy to incorporate creation, I would suggest something like this. As you can see I also partly agree with Doug about the placement of Synthesis being wrong although I would see it as equal to evaluation. As cognitive processes the two directly effect each other. Your ability to synthesise something is often based on your judgement but your judgement can be altered as you synthesise something. I include this as I think that it reveals a key feature of my thinking in this debate. I don’t believe that Media Literacy is neither ‘passive’ nor is it ‘consumption driven’. To be ‘Media-literate’ you need to have created your own Media. I have had many conversations in my time with colleagues about the merits and drawbacks of coursework in the Media Studies syllabus. I always come back to this: Can students truly understand the Media if they don’t create it for themselves? They already do in their daily lives but I want them to create texts more critically. I want them to unpack that process of creation. This undoubtedly improves their skills of analysis and their ability to evaluate. After all, you wouldn’t teach Maths by having students read the sums and then the answers; you make them work through the problems, learning how to solve them for themselves. You wouldn’t teach students to play football by doing nothing more than watching Manchester United on the TV. Without the doing (the ‘creating’) the learning is meaningless. 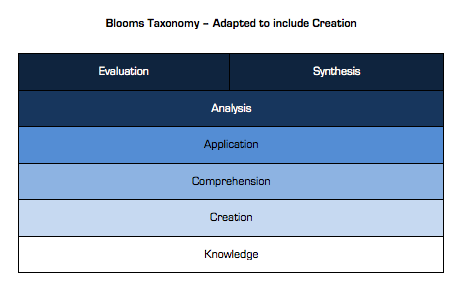 So perhaps Blooms should look more like this with creation featuring alongside every stage of the taxonomy, after knowledge. As ‘creating’ as a cognitive skills is imperative on the path to becoming literate. My thesis: You can’t be literate if you have never created. To be fully literate you need to create throughout your learning journey, only then will you be able to make meaningful judgements based upon fully informed analysis. Creation can help you piece it all together, what’s more cognitive than that? As you can see, there’s no reference to ‘creation’ here. It is but one definition, but as I mentioned to you on Twitter, everyone has their own ‘umbrella literacy’ which subsumes others. One literacy to rule them all! 3. I agree that literacy involves the reading and writing of texts, however metaphorically you want to understand the latter. I’m not sure I’d appeal to normative practice as an argument for this, however. That particular definition doesn’t mention evaluate either and in that sense I think it is a highly flawed. No consumer of Media is passive. Through selective perception (based on individual and cultural experiences) all people make evaluative judgements about the Media they see either agreeing, disagreeing or negotiating an understanding from it. Therefore, any definition of Media Literacy has to include evaluation. I agree that we should perhaps avoid appealing to ‘normative’ practice although in such debates it is logical to apply your own experiences. My experience in teaching (not just Media) has shown that understanding is always improved when creative processes are included. I think I’ll have to concede that ‘creating’ is not necessary for understanding to be shaped however, I do believe that literacy is greatly improved where ‘creating’ has occurred. Excellent blog post! Just want to comment on your point that you can’t be media-literate without creating media. I’m not too sure I agree with this – I think for the vast majority of media out there it is possible to be literate without having created that specific variety of media. I could certainly deconstruct an episode of Lost or the X-Files to find its meanings and intentions without having created a TV show or understand the contextual basis or propaganda elements of a Radio 4 garden show without having recording radio myself. I think by creating media once could certainly push yourself towards full competent literacy a lot quicker than someone else however that person who hasn’t created media should still get there eventually. I think your argument is true in terms of macro-level analysis but that for micro-analysis to be fully informed, some experience of being behind the camera (in role of mediator) is necessary. I see this with my students every year; there ability to analyse is altered having had the opportunity to be creators of Media themselves. Having been put through the processes of pre-production through to post-production a fuller (more real) understanding of how decisions in terms of camera angle, length of shot, choice of props etc impact on macro-level features such as representation and realism. I’ll revise my thesis slightly, and suggest that you can’t be ‘fully’ literate without having ‘created’. Now that you have added the macro and micro levels to your argument I think it makes a lot more sense and I can definitely see your point. True micro level literacy you are right comes more from being able to create the media and I think that certainly applies to most media categories. I would say I am a fairly competent photographer and as I grew in my technical skill I was able to comprehend the issues to do with composing and taking a shot to express a viewpoint much more easily. Here’s an alternative view. I think that the problem is that the word ‘creation’ is too generic. You’re both correct in pointing out that creation can be a very low level activity. It’s a specific type of creation that belongs at the top of the learning taxonomy, in my opinion – the creation of truly original ideas, works of art, or original ways of reexpressing existing ideas. That would put the works of a great scientist, composer, writer or film-maker at the top of the taxonomy, where, surely, they belong. I think that your argument is flawed in that there is arguably no such thing as an original idea. All creations are copies (be it re-expressions, re-imaginings or hybrids) and as such any text can be created based on learned (conscious or unconscious) experiences. There is plenty of TV and Music that has been produced with little evaluation having taken place. Perhaps, if they had taken the time to evaluate they wouldn’t have broadcast or released it. We have to avoid considerations of whether creation is ‘original’ or ‘great’ as these sorts of judgement have little to do with learning taxonomies. By the model that you suggest many learners would never reach the top of the hierarchy; they could work for a long time and not create an experiment, composition or film that we would deem ‘great’. Does that mean that they are not literate? 4) Creating a documentary film that explains your opinion on a controversial topic. I’m not suggesting that every student needs to be the next Einstein. There has to be some sort of quality control or judgement inherent at all levels of the taxonomy, or the taxonomy becomes largely meaningless. ‘Evaluating’ is on the taxonomy, but it’s very possible to evaluate badly (“It didn’t work” / “It was bad”) too. Should ‘Evaluating’ be removed from the taxonomy too, therefore? You can equally ‘apply’ what you’ve learned badly, or analyse badly, and so on. I find that deeply depressing, and it appears be at odds with history. Original ideas have been the driving force of human technological progress and culture change. While most original ideas ‘stands on the shoulders’ of previous work, that doesn’t relegate them to being mere re-expressions. One final point. Should we avoid putting something on the taxonomy simply because not all students will achieve it? Shouldn’t a good learning taxonomy have an aspirational nature to it? I can’t disagree with you about the fact that you can evaluate badly however it could be argued that if evaluation is done badly it really isn’t an evaluation. Is evaluation the process or the statements written down afterwards? Also, if by ‘original’ you mean ‘new’ then I would agree that the development of new ideas is both valuable and certainly worthy of status within a learning taxonomy although we are talking more about outcome than the process. However, no ‘new’ idea can be deemed to be entirely original. This is a fact as we base everything that we do on learned experiences. The only state in which something original can be created is where the creators has no prior knowledge and therefore what they do will not be coloured by previous learned experience. This is an impossible state. Take for example Science Fiction, there have been many ground breaking films that have imagined the world of the future yet they all resemble in many ways our world as it is now and often the world of our near-past. This is a perfect example of my argument. It is impossible for us to imagine an Alien world that is not like ours as we can only base our ideas on our understanding of the world in which we inhabit. You’re playing with the definition of ‘original’ in a way that, effectively, defines the word out of existence. What would constitute a work displaying originality for you? Any piece of literature, any film, any scientific idea or theological concept, will, of course, owe something to previous pieces of work. To dismiss The Origin of Species or King Lear as ‘not original’ because of this seems .. um .. slightly unfair, though, don’t you think? I think that your Science Fiction argument is a non sequitur. It is true that authors struggle to create worlds that are outside of human experience. This is not surprising. It does not follow, however, that their works therefore, by definition, display no originality. You called some of them ‘ground breaking’. How is this different from ‘original’? The top level of a Learning Taxonomy needs to reflect that the ultimate learning process as the creation of new ideas or knowledge. Our Higher Ed academic systems even recognise this in the awarding of PhDs, don’t they? Doesn’t this boil down to a debate about what creativity is? If we were to accept Sir Ken’s definition of creativity being the process of having original ideas that have worth then maybe we could agree that creation is a higher order cognitive skill than might be implied by the definition ‘just making stuff’. Or to simply consider ‘creativity’ within the educational context as ‘creating with purpose’. This negates Ken Robinson’s notion of ‘originality’ (which is difficult to evidence) and puts the emphasis on process. The process of creation is assessed in nearly all subjects. We assess the way learners create stories, paint, act. Even in so called ‘non-creative[ subjects, process is assessed. Maths for example, where students are expected to ‘show their working out’, allows for the assessment of process. It is within this notion of creating that I believe it to be a cognitive skill. Next Next post: Is it time for education to embrace entropy?